American Coach Heritage with 2016 ATC Aluminum Stacker Trailer. 650HP . Racers Special. This package will pull your race cars with no problem. 51,000 miles. Airsafe hitch to maximize ride. Located in Orlando Florida till mid April 2019. Stock #175638 Very well maintained quality coach with numerous premium features & engine upgrades & has three coats of clear on custom paint and extra detailing!! 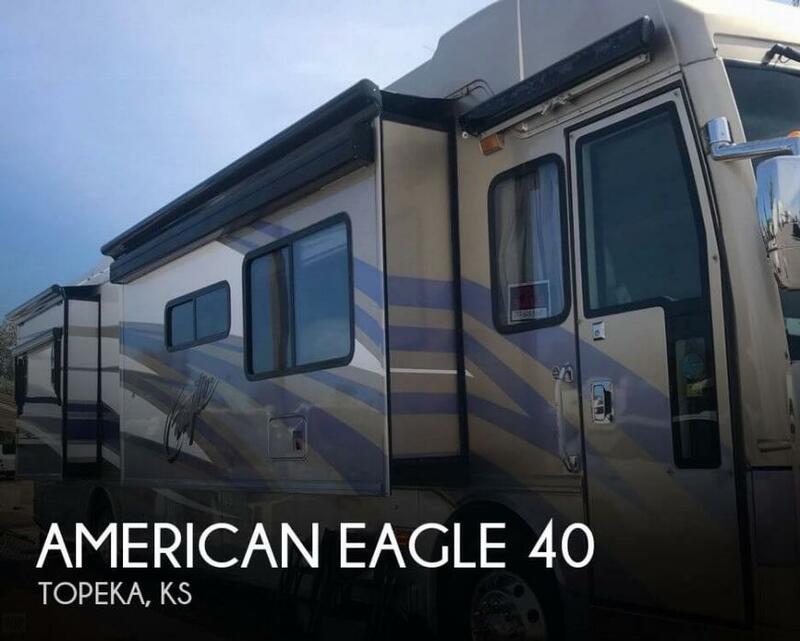 If you are in the market for a class a, look no further than this 2004 American Eagle 40L, just reduced to $83,400. This Class A is located in Topeka, Kansas and is in great condition. She is also equipped with a Cummins engine that has 122,000 miles. The exterior has very minor paint chips and fading. The interior is in exceptionally good shape with noticeable wear on the front passenger seat, but it does not have any tears or rips. There are three ceramic tiles in the main living area which are cracked and displayed in the photos. On the driver's side exterior is a minor scratch noted in the photos. The odometer is an LCD and cannot be read. The seller advises it has been fading over time, but the reported mileage is accurate as he drove it on a trip a few weeks ago and could read the mileage at that time. Stock #162588 Excellent AMERICAN TRADITION 40TVS with new tires and very low mileage! If you are in the market for a class a, look no further than this 1999 American Tradition 40, priced right at $52,500. 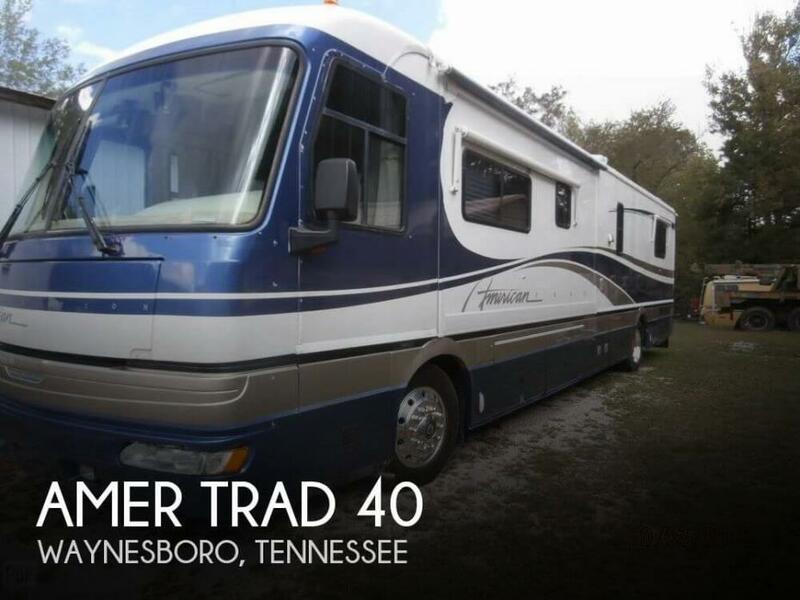 This Class A is located in Waynesboro, Tennessee and is in great condition. She is also equipped with a Cummins engine that has 35,000 miles. Reason for selling is buying smaller unit. The clear coat is showing wear and there are some normal cosmetic issues. Rust can be seen also in several places such as in the motor housing area. The refrigerator needs some work, possibly a new cooling unit. Washer/ Dryer combo needs repair as the water runs continuously. The stabilizing jacks are not functioning as well. The tires are heavy duty truck tires requiring 100 lbs. Dual tires on the rear axles. The tires are GOODYEAR. The RV is equipped with an onboard air-compressor that pressurizes more than adequately. Because he is selling as is the repairs will be up to the buyer. Stock #169460 Low Miles! One Owner! Well Cared For! Ready For You To Begin Your Travels! If you are in the market for a class a, look no further than this 2000 American Dream 40, just reduced to $43,989. 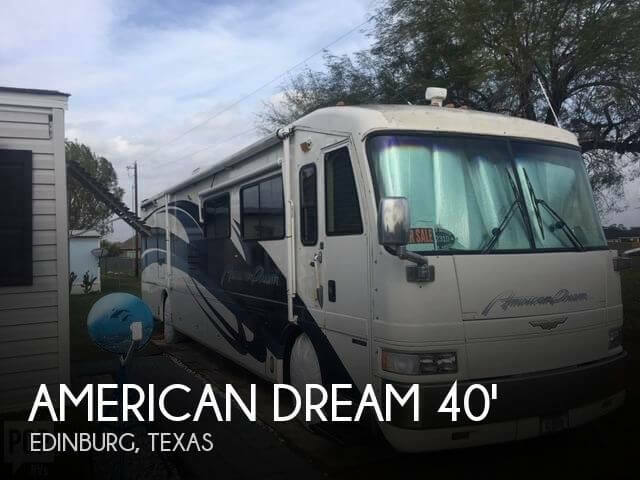 This Class A is located in Edinburg, Texas and is in good condition. She is also equipped with a Cummins engine that has 70,011 miles (as of February 1). Reason for selling is done with traveling in an rv. Exterior paint and graphics appear like new condition. Owner states that all mechanical and electrical systems function properly. The generator has low 500 hrs of use. Interior appears like new and is very clean. Fiberglass Roof has no leaks according to Owner. 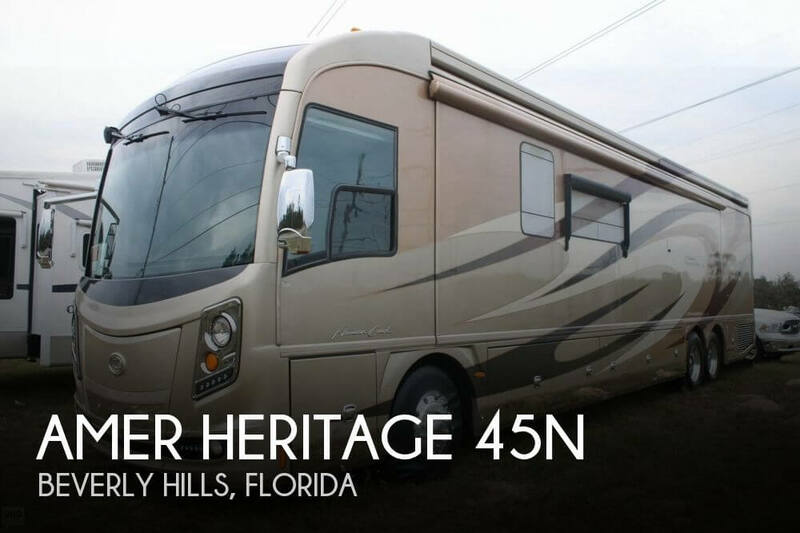 Tire are original and Aluminum wheels are in good condition Stock #164310 Fully loaded luxury Motor coach, low miles and use, meticulously maintained If you are in the market for a class a, look no further than this 2013 American Heritage 45N, just reduced to $349,900. This Class A is located in Beverly Hills, Florida and is in great condition. She is also equipped with a Cummins engine that has 47,839 miles. Reason for selling is bought a house and no longer using. Normal wear for a 1995 model. The motor started right up as did the generator. The roof feels solid and the owner states there are no leaks. There are some personal effects inside that will be removed at closing. Good amount of storage and walking space. Stock #161416 In Good Condition, Motivated Seller, Ready to Roll, and All you'll ever need! If you are in the market for a class a, look no further than this 1995 American Dream 39J, priced right at $27,300. 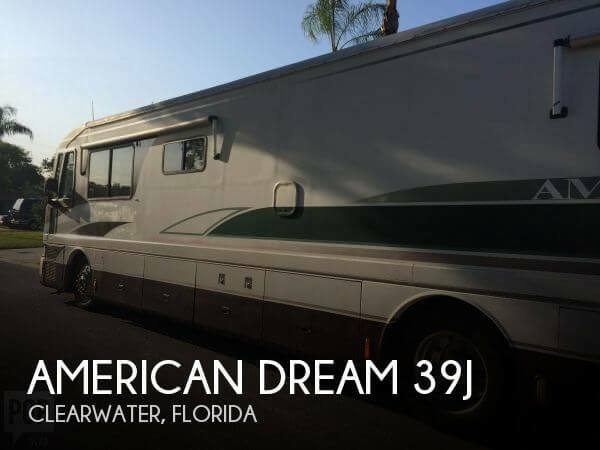 This Class A is located in Clearwater, Florida and is in decent condition. She is also equipped with a Cummins engine that has 102,000 miles. 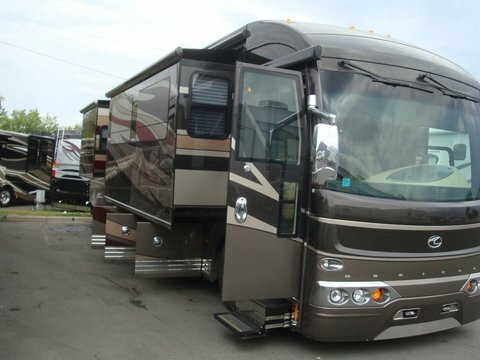 This RV is in excellent condition and is exceptionally clean! This beauty has been well loved and well maintained with all regularly scheduled maintenance being carried out, and the tires changed in 2017 and 20118. Upon personal inspection, all systems were checked and in proper working condition. All interior tile floors and leather upholstery are in excellent condition, showing no signs of excessive wear or rips/tears of any kind. All slides are operational. All 4 flat-screen TVs are in good working condition. Stock #151603 WOW! Super Clean Diesel Pusher! 10kW Gen ~ Washer/Dryer ~ Dishwasher ~ AC ~ 4 TVs ~ Blu-Ray ~ Very Well Maintained and in Excellent Condition! 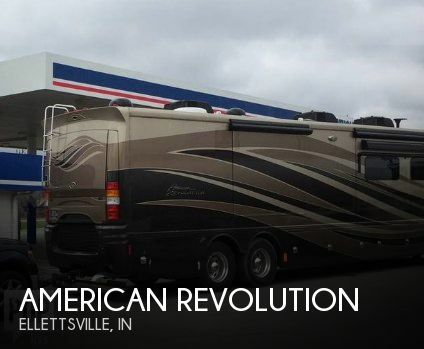 If you are in the market for a class a, look no further than this 2013 American Revolution M38S, just reduced to $184,000. 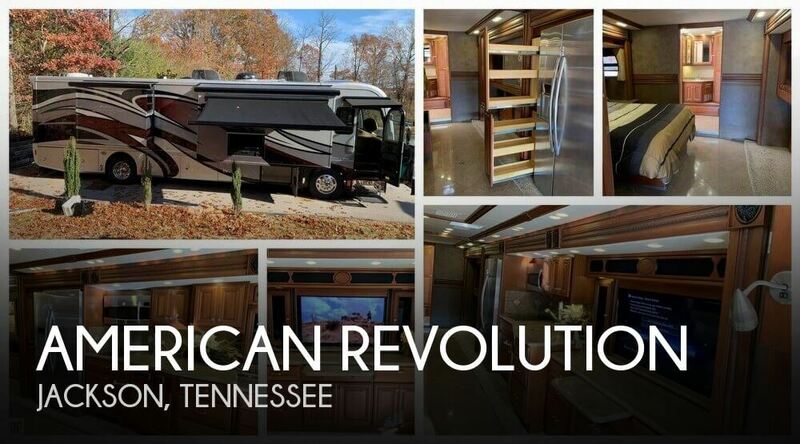 This Class A is located in Jackson, Tennessee and is in great condition. She is also equipped with a Cummins engine that has 37,575 miles (as of November 30). Reason for selling is downsizing. According to the seller: The condition of this coach is like new. No rips or tears in the upholstery. All appliances are in working order. A/C keeps everything nice and cool. This coach is ready to go where ever your heart desires. Stock #159101 42T All ELECTRIC DIESEL PUSHER W/ TAG AXLE. Coach is in excellent condition! Reason for selling is lack of use. New ceramic tile being installed by the owner. Seller reports all service performed and records available. Satellite TV. Entertainment center is well positioned. The stereo system is plentiful with ceiling mounted speakers throughout. Cosmetic repairs needed at the front passenger side bumper. Driver side windshield is cracked and requires replacement. No slide topper. No entry door glass - seller reports to be replaced prior to sale. NOTE: Currently, living area slide is not operational and will be sold as is. Stock #170609 Classic American Eagle! Low mileage! New tile flooring! Top quality RV. Ready to travel! If you are in the market for a class a, look no further than this 2003 American Eagle 40M, just reduced to $35,000. This Class A is located in Banning, California and is in decent condition. She is also equipped with a Cummins engine that has 76,490 miles. Reason for selling is no longer used. It doesn't take a trained eye to see that this coach is well cared for. It has been stored in a covered building since it was new and the seller reports that all mechanical and operational systems function as intended. 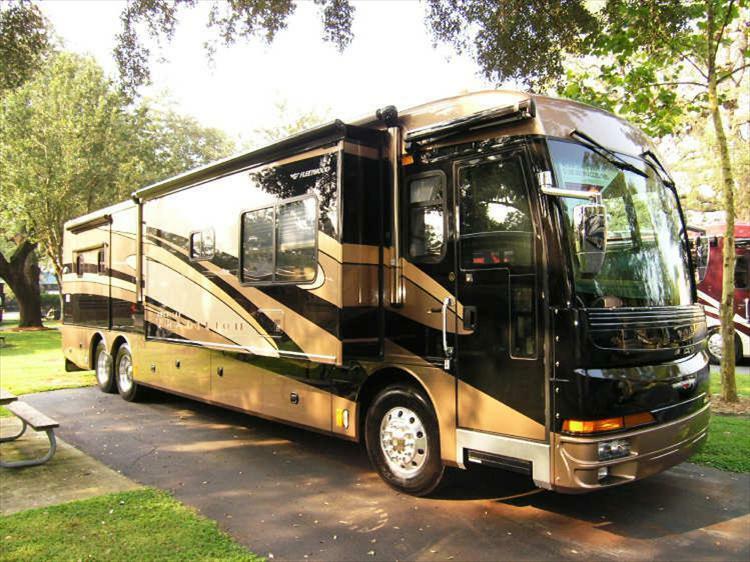 Stock #172454 Luxury RVing At It's Finest!! Bath and A Half!! All the Toys!! Heated Floors!! Only 25K Miles!! If you are in the market for a class a, look no further than this 2015 American Tradition 45A, just reduced to $299,000. 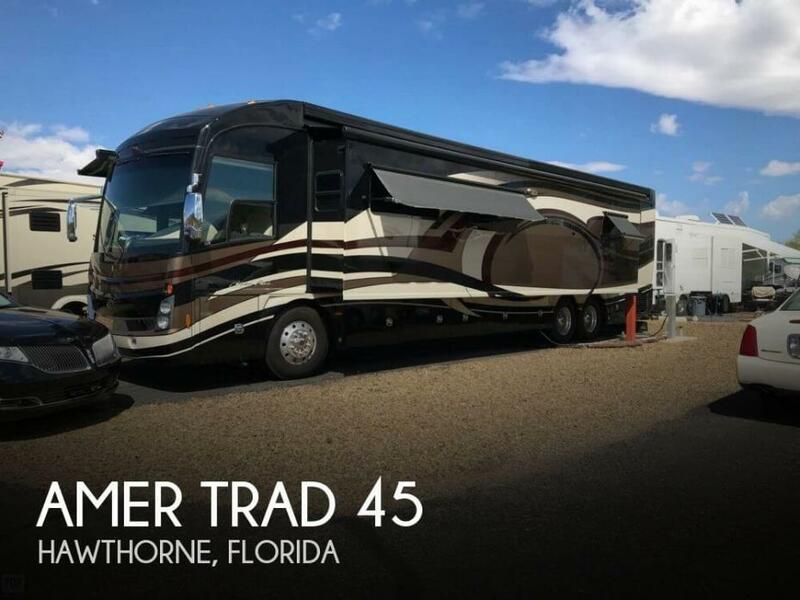 This Class A is located in Hawthorne, Florida and is in great condition. She is also equipped with a Cummins engine that has 25,378 miles (as of March 6). Reason for selling is getting out of rving. This Fleetwood has been extremely well maintained inside and out. Seller states it is clean and ready to go. Seller has lots of extra items for safe travels, extra belts, fuel filters, etc. Tires in front are only a year old, and rear tires are about 4 years old but have lots of tread left. Seller is downsizing so call to take a look at this beauty. Stock #164413 Always garage kept! VERY clean & low miles! Ready for the road! If you are in the market for a class a, look no further than this 1999 American Dream 40, priced right at $52,800. This Class A is located in Lawrence, Mississippi and is in good condition. She is also equipped with a Cummins engine that has 71,000 miles. Reason for selling is down sizing.. This Luxury Coach is in very nice condition. The two sofas have been removed and are not available. There are two recliners and a deep freezer the seller has added and are included. The Diamond Shield protective coating on the front of the coach will need some maintenance Stock #158712 Excellent Condition, Low Miles. Loaded with options and features. If you are in the market for a class a, look no further than this 2009 American Allegiance 42T, just reduced to $169,000. This Class A is located in Buckhead Ridge, Florida and is in good condition. She is also equipped with a Cummins engine that has 27,992 miles (as of August 30). Reason for selling is can't drive anymore. 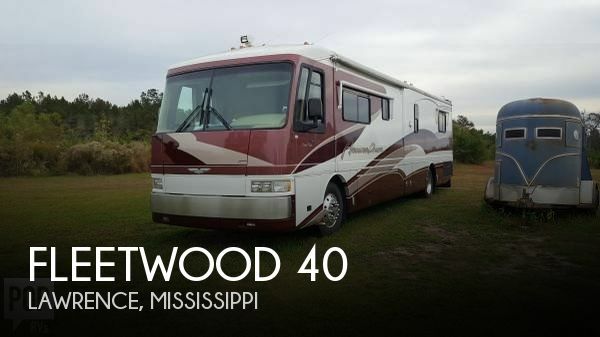 This 1998 American Tradition 40TVS is a good condition and has been well maintained by the owner. 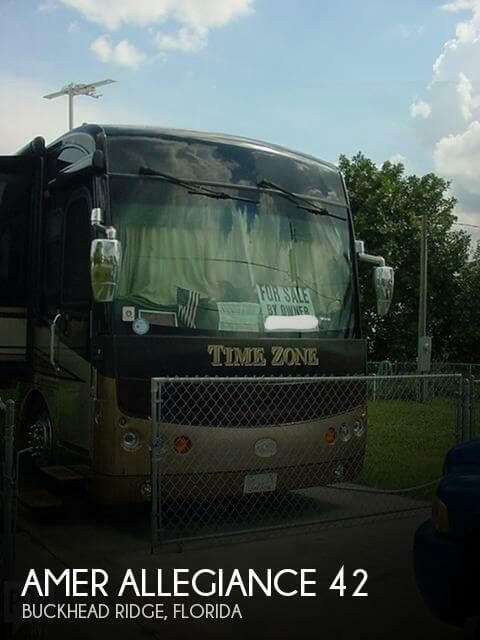 The owner has done all the maintenance on this RV and everything is in working order. The only reason they are letting this go is that is does not get used enough. It has new front tires. The power awning is currently inoperative and has to be put up manually. The information and pictures of this Recreational Vehicle has been provided by the owner of the Recreational Vehicle. 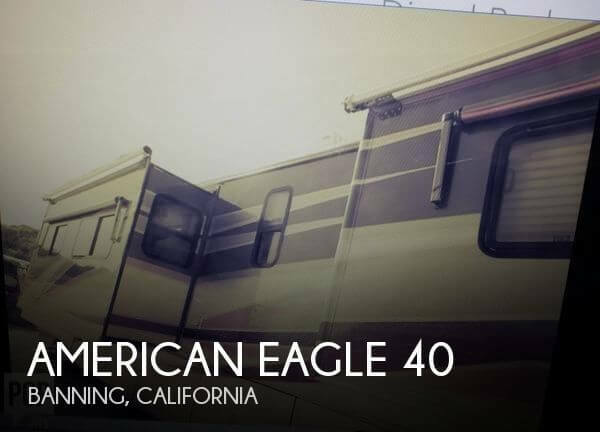 This Recreational Vehicle has not been viewed or inspected by a representative of POP RVs. To the best of our knowledge and with the approval of the owner the information and pictures in this ad properly represents the Recreational Vehicle. Stock #100186 1998 American Tradition class A 40ft RV! Good condition! Ready to go! If you are in the market for a class a, look no further than this 1998 American Tradition 40TVS, just reduced to $39,000. 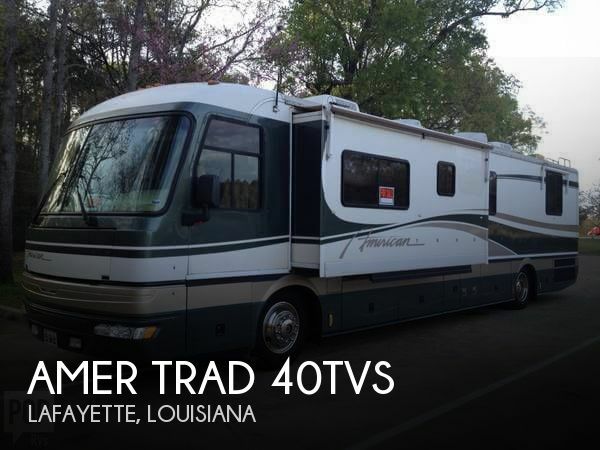 This Class A is located in Lafayette, Louisiana and is in good condition. She is also equipped with a Cummins engine that has 135,000 miles. Reason for selling is not used enough. Current owner (2nd Owner) say's his 2004 AMERICAN TRADITION (BY AMERICAN COACH) 40 is "Like New" inside & out...!! As provided by the current owner; RV is very very clean inside and out Very well maintained Tires are 3-4 years old ONAN Generator was recently repaired (spring 2017), by a ONAN certified technician, repair cost was $2,400 Cummins diesel Red-Top 375 HP engine runs great, and has only 31,600 miles...!! *** I have not inspected this RV in person. Pictures & details have been provided by the owner, please do not hesitate to contact me with any questions, to submit an offer, or schedule a showing*** Stock #142607 CUMMINS 375 HP RED-TOP DIESEL, ONAN GENERATOR, 2 A/C UNITS & CENTRAL VAC & IN-MOTION TV SATELLITE SYSTEM ....!! If you are in the market for a class a, look no further than this 2004 American Tradition 40, just reduced to $79,995. 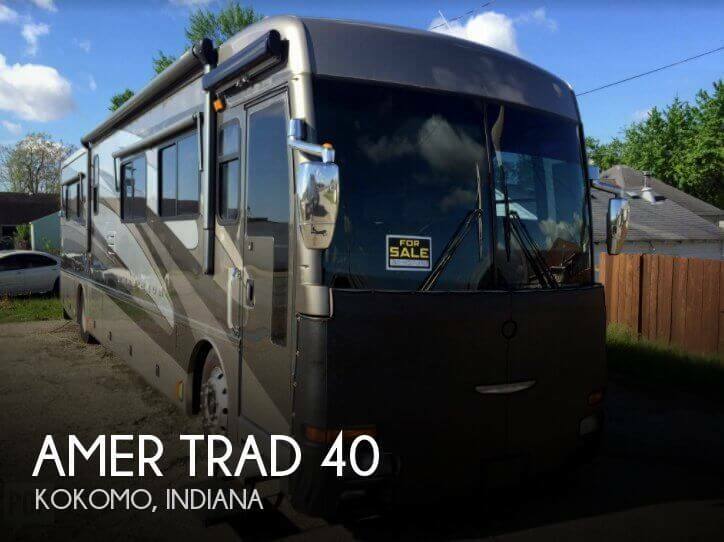 This Class A is located in Kokomo, Indiana and is in great condition. She is also equipped with a Cummins engine that has 31,600 miles (as of January 23). Reason for selling is no time to use.